Mouse anti Bovine IgA antibody, clone K84 2F9 used for the measurement of Tci-L4-ES-specific IgA responses in sheep by ELISA. The effects of T. circumcincta infection on Tci-L4-ES mediated lymphocyte suppression. Seven helminth-naïve lambs were trickle infected with 2000 T. circumcincta L3 three times a week for four weeks. PBMC were harvested at 0, 2, 4 and 6 weeks from the start of infection and cultured for 72 h with PBS alone (PBS), 5 μg/mL Con A (Con A + PBS) or 5 μg/mL Con A + 15 μg/mL Tci-L4-ES (Con A + ES). Proliferation was assessed at 72 h by measurement of [3H] thymidine incorporation. 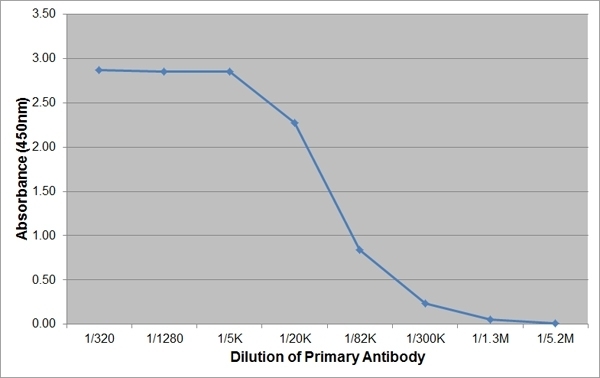 Levels of cytokine present in the cell culture supernatants at 54 h were determined by ELISA. (A) Faecal egg count (FEC) data over the course of the experimental infection. (B) Proliferation of PBMC in response to PBS, Con A + PBS and Con A + ES during experimental T. circumcincta infection. (C) Levels of serum Tci-L4-ES-specific IgA and IgG during experimental T. circumcincta infection. (D-F) Concentrations of IL-4, IL-10 and IFN-γ in PBMC cultures supernatants. Data represents mean ± SEM. a significant difference between Con A + PBS vs. PBS-stimulated cultures; b significant difference between ConA + ES vs. PBS-stimulated cultures; c significant difference between Con A + PBS vs. Con A + ES stimulated cultures; *P < 0.05, ** P < 0.01, ***P < 0.001 (repeated-measures two-way ANOVA followed by the Bonferroni post hoc test for comparison of means). From: McNeilly TN, Rocchi M, Bartley Y, Brown JK, Frew D, Longhi C, McLean L, McIntyre J, Nisbet AJ, Wattegedera S, Huntley JF, Matthews JB. Suppression of ovine lymphocyte activation by Teladorsagia circumcincta larval excretory-secretory products. Vet Res. 2013 Aug 21;44:70..
Spleen cells from immunised mice were fused with cells of the P3.X63.Ag8.653 myeloma cell line. Estes, D.M. et al. (1998) Effects of type I/type II interferons and transforming growth factor-beta on B-cell differentiation and proliferation. Definition of costimulation and cytokine requirements for immunoglobulin synthesis and expression. Suraud, V. et al. (2008) Acute infection by conjunctival route with Brucella melitensis induces IgG+ cells and IFN-gamma producing cells in peripheral and mucosal lymph nodes in sheep. Hassan, M. et al. (2011) The dynamic influence of the DRB1*1101 allele on the resistance of sheep to experimental Teladorsagia circumcincta infection. Stanley AC et al. (2004) Intranasal immunisation with Toxoplasma gondii tachyzoite antigen encapsulated into PLG microspheres induces humoral and cell-mediated immunity in sheep. McNeilly, T.N. et al. (2007) Simple methods for measurement of bovine mucosal antibody responses in vivo. Vet Immunol Immunopathol. 118 (1-2): 160-7. McNeilly, T.N. et al. (2010) IgA and IgG antibody responses following systemic immunization of cattle with native H7 flagellin differ in epitope recognition and capacity to neutralise TLR5 signalling. McNeilly, T.N. et al. 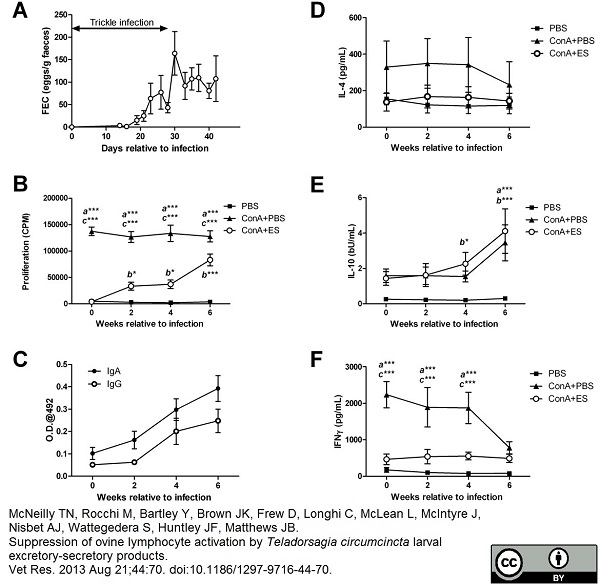 (2010) Immunization of cattle with a combination of purified intimin-531, EspA and Tir significantly reduces shedding of Escherichia coli O157:H7 following oral challenge. Suraud, V. et al. (2007) Differential expression of homing receptors and vascular addressins in tonsils and draining lymph nodes: Effect of Brucella infection in sheep. Vet Immunol Immunopathol. 115 (3-4): 239-50. Mahajan, A. et al. (2005) Phenotypic and functional characterisation of follicle-associated epithelium of rectal lymphoid tissue. Cell Tissue Res. 321 (3): 365-74. Parreño, V.et al. (2004) Modulation by colostrum-acquired maternal antibodies of systemic and mucosal antibody responses to rotavirus in calves experimentally challenged with bovine rotavirus. Vet Immunol Immunopathol. 100 (1-2): 7-24. Mahajan, A. et al. (2009) An investigation of the expression and adhesin function of H7 flagella in the interaction of Escherichia coli O157 : H7 with bovine intestinal epithelium. Cell Microbiol. 11 (1): 121-37. McNeilly, T.N. et al. (2013) Suppression of ovine lymphocyte activation by Teladorsagia circumcincta larval excretory-secretory products.